With more than six weeks of Autumn behind us already there has been much excitement about autumn produce, so it seems appropriate that I write about our vegetable garden. Starting a vege patch was a condition of our move up north, as far as I was concerned. I'm not sure where the motivation came from, but I was determined to grow food. I envisaged espaliered apple trees, fully established citrus, laden fig trees and maybe even pomegranates. Instead, I have a bare house block and next-to-no gardening knowledge. And so begins my gardening journey. I have been assured it is one that will provide boundless satisfaction and a little heartache, and it will never end. You have to crawl before you can walk, so we have been planting little and planning lots. But the vege patch is underway. I have to admit it has been more successful that I thought, with very little human input, thanks to rainy yet warm weather. 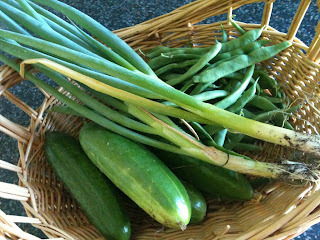 Summer produced an abundance of beans, basil and cucumber, which have all just about come to an end. I know I have to dig up the gone-to-seed basil, but I'm feeling more than a little emotionally attached. For so many years I saw a few straggly sprigs growing in pots in my South Melbourne courtyard. This summer I had basil up to my waist. In their place I hope to grow snow peas, chicory, watercress and leeks. Parsley, thyme and sage are still going well, although the chives were suffocated by the prolific basil. We built a no dig garden, a term which has recently seemed far more technical than it needs to be. Stephanie Alexander's Kitchen Garden Companion recommends a list of ingredients longer than that of the recipes. Pea straw, lucerne, newspapers, seaweed fertiliser, manure, Hydrocell, organic compost and so on. This six-layer method recommends quantities suitable for a 1 metre x 1 metre garden. As we have a space nearly three-by-three, the scientist in me decided we needed 3 times the quantities and suddenly our vege patch was looking very expensive indeed. So, we took some shortcuts - especially after the assistant at the local landscape supply store politely pointed out that we would not fit three cubic metres of soil in a box trailer. (For future reference, a box trailer holds 0.5 cubic metres). The final result? One layer of cardboard, a layer of lucerne, a layer of three-in-one (compost, manure and soil), another layer of lucerne, and another layer of three-in-one. And it seems to work. We didn't follow a "recipe" or get too technical (or rather, we did, then saw the light), we just got on and did it. So here's to some happy Autumn growing. Let's hope it's as fruitful as the Summer crop.